Griffith Park can be an even more amazing place to ride a bike, but I’m happy the way it is. Almost everyday, I look forward catching a piece of the magic riding Western Canyon or Vermont Canyon with some Mount Hollywood Drive and Vista del Valle mixed in. At the same time, it’s hard to ignore all the other fire roads and trails cyclists are restricted from. For the park’s sake, I’ve respected these rules to play my part keeping Griffith as wild as possible. Even when Mountain Biking was part of an early proposal for the Olympics, I definitely questioned the thought process for its inclusion. On Monday, I decided to take a side excursion to the Hollywood Sign, but things were a bit different as I made my way up. 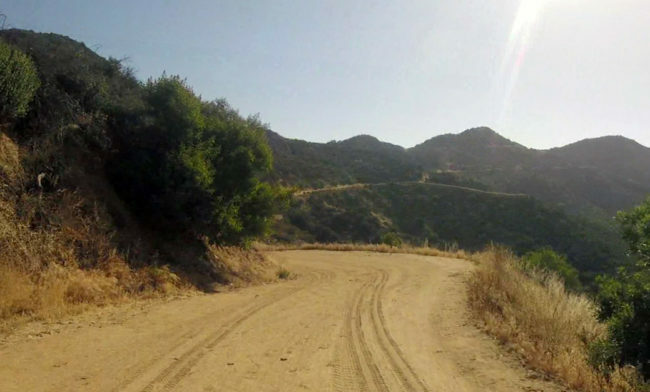 A bunch of trucks lined the area and workman told me I had to take the fire road to my right which is a connector to Mount Hollywood Drive because. This section is supposed to be closed to bikes, but this guy didn’t seem to be in a place for me to correct his reasoning. Without argument, I decided to follow suit and do what the boss says also lucky enough to be riding the proper bike for it too. Normally, I have my camera record when I’m sharing the road with drivers, so I powered it back up to take in the experience. This doesn’t show as well in the video, but for this segment, I felt the most out of touch with urban life as the road cut through the hillside. I kept a cautious pace as the surface was loose and sandy, but also to dismount if there were any horseriders approaching who were unaware with my hall pass. It was a short, but fantastic experience as I tried to imagine an earlier Los Angeles that looked more like this. I’ll probably do this route again, but next time hiking to take it in even more.